Tim Dempsey and Gemma Fletcher are two of RAYC’s most competitive sailors. 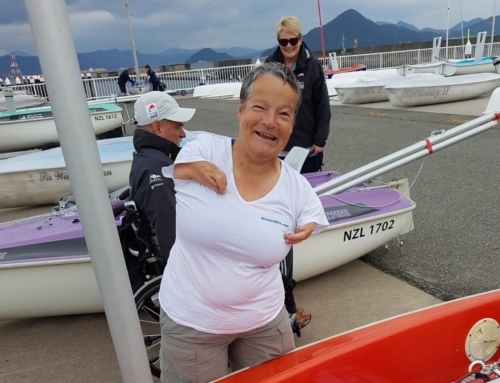 They are sailing in the SKUD 18, a boat specifically designed to allow sailors with various disabilities to compete and experience the high octane sport that is Skiff racing. Dempsey, a former Paralympic sailor, is affected by Becker Muscular Dystrophy which is a progressive muscle wasting condition, while Fletcher, an upcoming young sailor, received a spinal injury after a severe car accident at the age of four and has been a wheelchair user since. 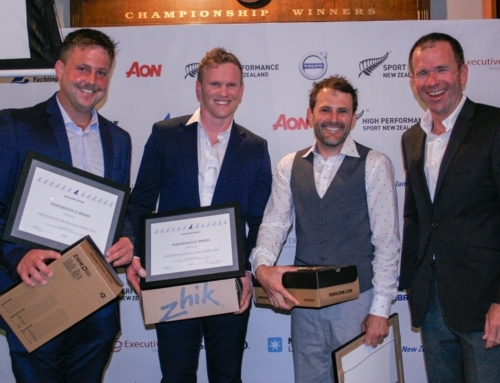 Sailing the SKUD 18 together since 2013, they have achieved Gold at the previous two Sail Auckland events in 2014 & 2015, along with a Silver at the 2014 Sail Melbourne regatta which was their latest World Cup event. 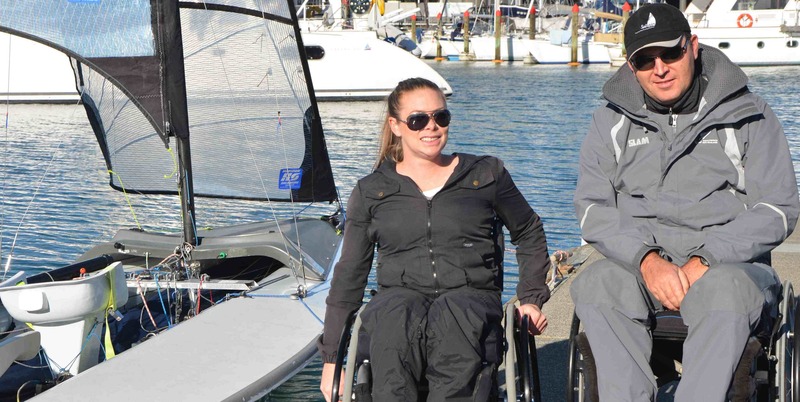 The goal for the pair is to get to the 2016 Paralympics in Rio and win New Zealand’s first Paralympic medal in sailing. 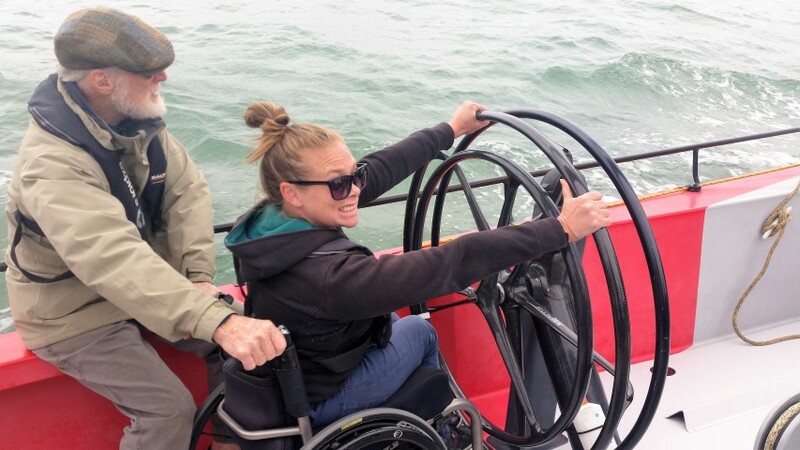 Yesterday, they got one step closer to achieving their goal- working with Explore NZ to help raise much needed funds to get to the Para Worlds later this month, they arranged an opportunity to have a real America’s Cup racing experience on NZL041 and NZL068. Having been involved with Tim and Gemma from a coaching perspective through Sailability Auckland, I was lucky enough to be invited along for the morning’s racing. Tim was resigned to the shore crew, though he had a pretty awesome view of the racing from RAYC , while myself and Gemma were part of the crew on NZL068. We rolled into the start from the port end of the line and managed to sneak around the bow of NZL041. Five minutes later we started the race: both boats had an even start but we managed to sail the higher course and forced NZL041 to tack away on Port. When we came back together we put in a nice lee-bow tack- again forcing NZL041 to tack- we were gaining every time. We utilised the strong incoming tide and managed to lay through to the top mark in Stanley Bay and round two boat lengths ahead. We didn’t have a great hoist of the fractional gennaker and this let NZL041 back into the race. We held them off well until the bottom third of the race course, when NZL041 managed to get to windward of us and affect our air. Sailing right into the wave break at Orakei (fantastic for Tim to view from the shore!) they gybed and crossed our bow, taking the win by a little over a boat length. On the way back to the Explore Group base in the Viaduct Marina Gemma untied herself from her “18th man” position and took the helm, an awesome experience for her as Tim usually has full control over the helm. All-in-all it was a very fun morning on the water and our Paralympic sailors are one step closer to their goal! In two weeks Tim and Gemma will be off to Melbourne to race in the 2015 IFDS worlds, along with their kiwi rivals Paul Webber and Amanda Beaver. Best of luck guys! Tim and Gemma still need to raise another $4,000 and are running a raffle with first prize being VIP Tickets for 2 to UB40 on 17 January at Matua Winery plus heaps of other prizes. To get your ticket or make a donation visit www.fundraiseonline.co.nz/kiwiskudsailing The raffle will be drawn at RAYC on Friday 13th November at Tim and Gemma’s farewell BBQ at RAYC from 5.30 on, everyone is welcome. Great photos,of Gemma,.our great-niece. Tim & her are a great team.and may they do well.